We were early at the venue of the seminar we organized before the Holy Week. 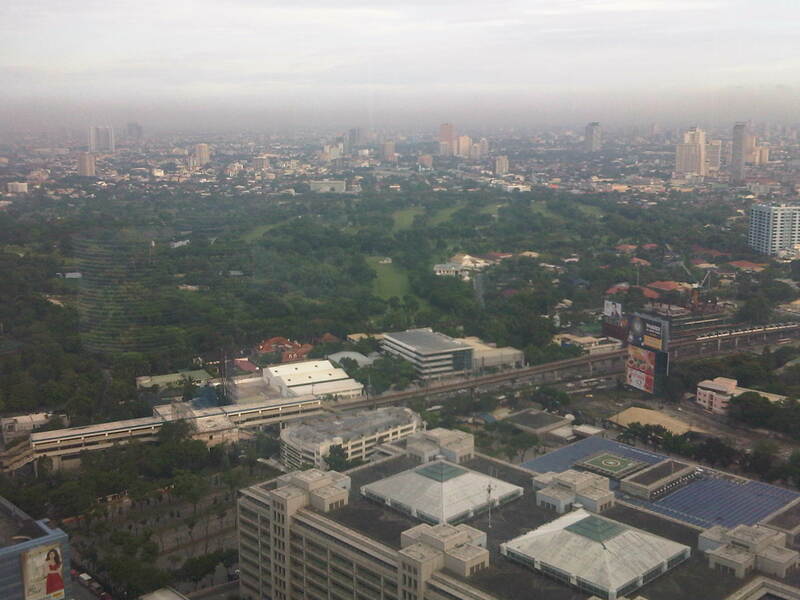 The seminar venue was on the top floor of a tall building in the Ortigas Center area and afforded us an almost 360 degree view of the surrounding areas and beyond. At 6:45 AM, the sun was steadily rising and it was already bright enough to look into the horizon from different parts of the venue. I took the following shots while we were setting up for the seminar and it is clear that air quality is really bad in Metro Manila and its surrounding areas. Most of this may be attributed to vehicle emissions as the DENR estimates 65% of air pollutants coming from mobile sources while only 21% are from stationary sources (i.e., factories) and 14% from area sources (e.g., burning of garbage or grass). Golf anyone? – from one side of the building, you could see Wack-wack golf and the EDSA-MRT as well as the roof top of the ADB headquarters. 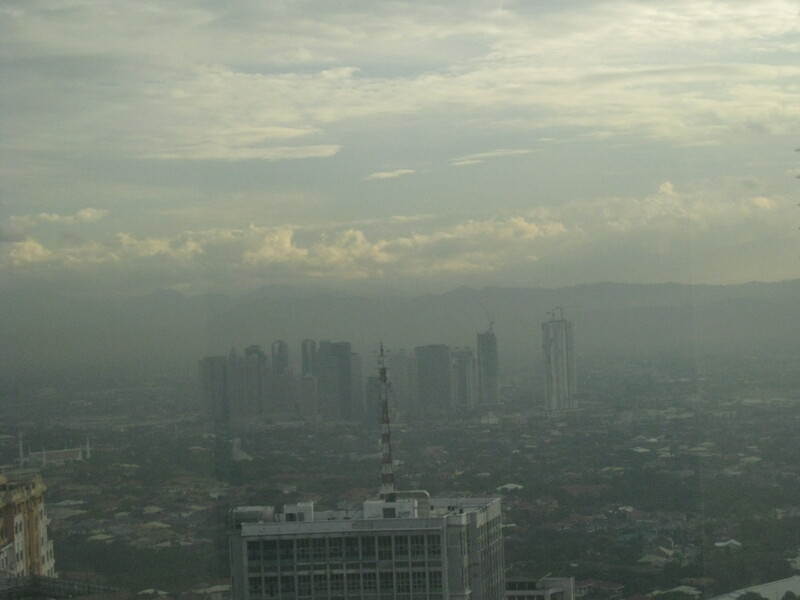 One can also see the thick band of dark brown (or is it brownish black) that is the smog covering much of Metro Manila. Early morning golfers and joggers probably are not aware of the health implications of their activities that morning. The building where the DOTC has its offices is located is also visible in the photo (middle of the right edge of the picture). 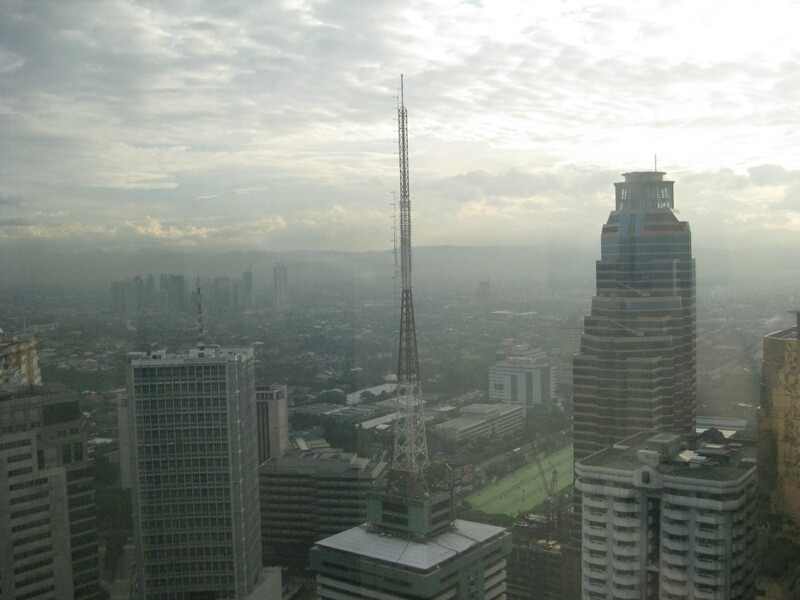 Makati skyline – visible in the horizon in the center of the photo is the Makati CBD with its tall buildings. People looking from atop a building on that side will see the Ortigas skyline and a band of brown. Contrast this with the blue sky and clouds at the top of the photo. The south – beyond the Tektite Towers and other prominent buildings along San Miguel Avenue is the south (Paranaque, Las Pinas and Muntinlupa). Also, there is Taguig and Pateros along the line of sight from this photo. 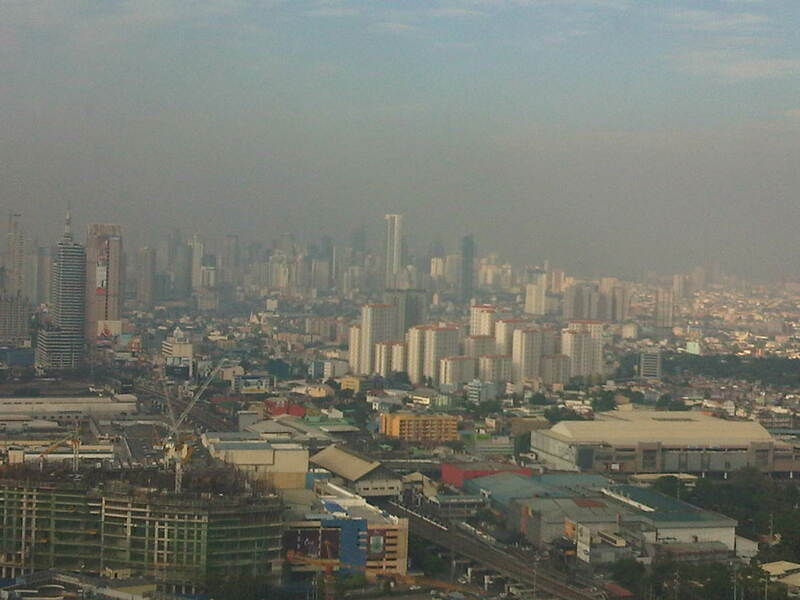 There are buildings of Bonifacio Global City visible on the right in the horizon. The sun rises from the east – as with Manila Bay sunsets, the colors produced by the sun become quite dramatic when combined with the pollution (Yes. The dramatic reds and oranges you get from sunsets may be attributed to the air pollution.). One is supposed to see the mountains of Antipolo in the horizon but because of the smog and the exposure of the shot, you can only see an outline of the mountains and an idea of what people in the lower parts of Rizal breathe everyday. 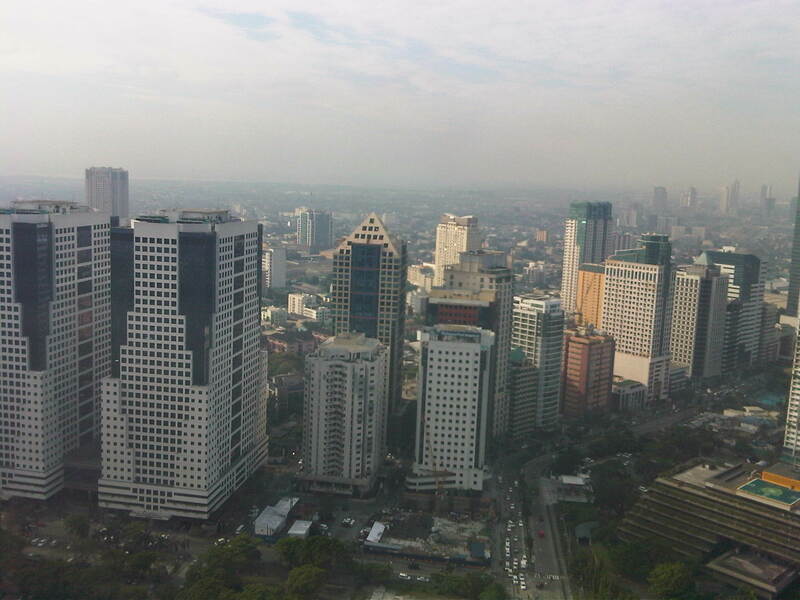 The Ortigas Center is located in Pasig City and the areas between Rizal and our location are all within that city. Quezon City and beyond – right next to Pasig to the north is Quezon City, and beyond along the line of sight is the Marikina Valley and the mountains of San Mateo and Montalban (now Rodriguez). That’s Eastwood with its tall buildings barely seen in the smog to the left of the photo. Take two – a closer look of Eastwood and the outlines of the Sierra Madre mountains. 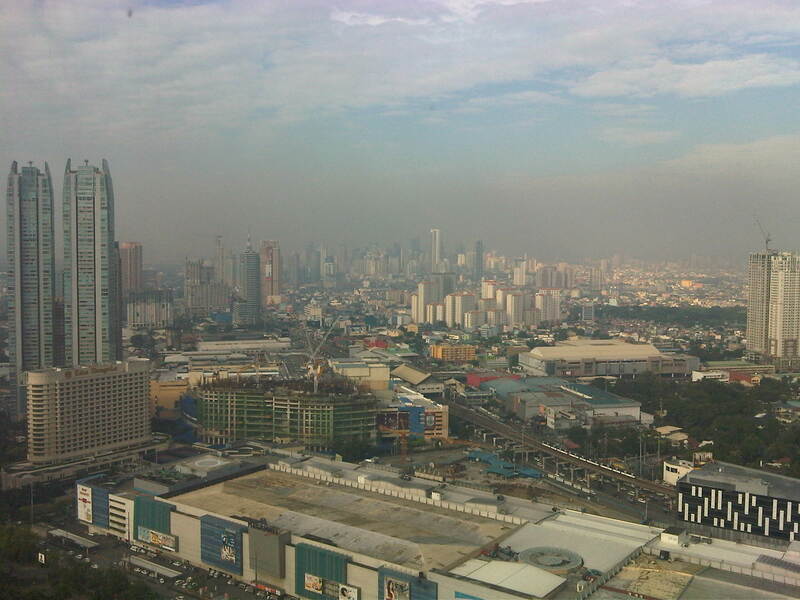 The smog seems thicker over the Marikina Valley and Quezon City as any other structure is practically hidden by it beyond Eastwood. The photos above are on-the-ground validations of aerial observations I earlier posted. It can only go worse given the onset of the driest part of the year and behavior of air circulation at this time of the year. Of course, one isolated typhoon or weather system passing through Metro Manila can dissipate this smog but it will only return to wreak havoc on our health. So much for the Clean Air Act and other initiatives? We should try harder including doing our part in reducing our carbon footprints. Perhaps we should be honest in the way we maintain our vehicles. Perhaps we should demand more from public transport operators and truckers as they constitute a significant part of visible and observable smoke belching. Perhaps we should not encourage the proliferation of motor tricycles but instead replace most of these with non-motorized ones especially in residential areas. Air may be free but we are all at risk even in the perceived safety of our homes. By d0ctrine in Air quality on April 10, 2012 .